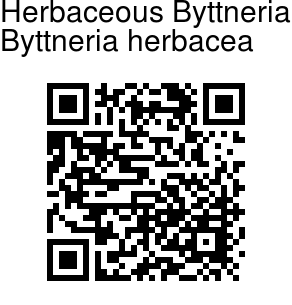 Herbaceous Byttneria is a profusely branched prostrate herb, with stem hairy. Leaves are simple, alternate, 2-3 x 1.5-2.5 cm, ovate, base heart-shaped, margin toothed, hairy, hairless beneath. Bracts are 1-3, subulate, sepals are basally fused, 4 mm, oblong-laneshaped, petals appendaged, 4 mm, red, staminal tube with 5 stamens and 5 staminodes. Ovary is velvety, 5-celled. Fruit is 0.8 mm across, spherical, septicidal; seeds 1 in each locule, muricate. 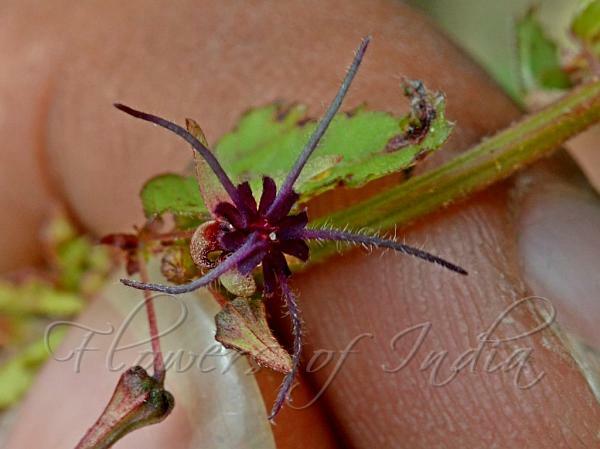 Herbaceous Byttneria is found in Peninsular India. Photographed at Taralu Estate, Bangalore.